The PSAPs of Maricopa County, Arizona, show that when technology integrators and developers come together, new possibilities and hybrid solutions can bridge gaps and advance the entire industry. Dave Eaton has been working with Geographic Information Systems (GIS) and mapping solutions for more than two decades. The GIS Manager for Maricopa Region 911 for the past 14 years, Eaton previously worked as a GIS analyst for the Phoenix Fire Department. Prior to 2012, Eaton says, he had only “dabbled” in platform development and integrations. That was the year that Maricopa County, Arizona, began exploring web mapping and later moved to its own in-house system. Like many of the nearly 6,000 Public Safety Answering Points (PSAPs) across the country, Maricopa Region 911 easily identified the benefits of self-hosting and managing its own GIS resources: improved logistics, reduced upgrade costs, and simple operation with no wait time for vendor updates. The sheer size of the region, however, presented a unique challenge. Maricopa Region 911 comprises a total of 25 PSAPs in Maricopa County and one PSAP in Pinal County. It serves the cities of Phoenix, Mesa, Chandler, Glendale, Scottsdale, and Tempe, as well as dozens of other communities spanning more than 9,200 square miles with a population of more than 4 million. For security reasons, most PSAPs rely on self-hosted, fully contained technology resources such as maps, phone systems, and other tools. As a result, integration with outside systems and coordination with other PSAPs or partners is difficult—and sometimes downright impossible. Yet connectivity across 26 PSAPs wasn’t just a nice-to-have for Maricopa Region 911. The agency had to build something that had the security of a self-hosted system and the scalable flexibility of cloud computing to improve common operating picture in and around the county. Knowing the challenges Maricopa Region 911 faced, Eaton worked to determine whether a hybrid solution that met the jurisdiction’s needs was possible. According to Eaton, the use of aerial imagery was always part of the plan. 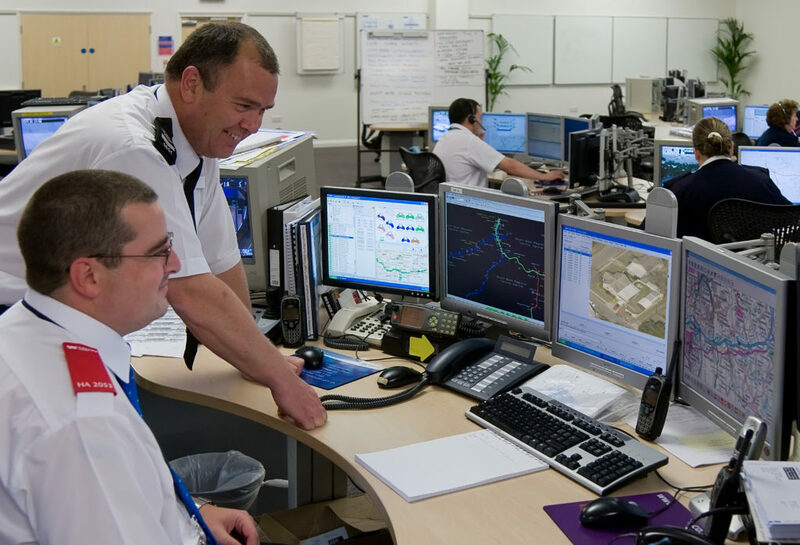 In particular, the agency needed oblique imagery taken at a 40- to 45-degree angle to give call takers and dispatchers critical location intelligence during an incident. That means being able to pinpoint landmarks or identify doors and windows on a structure—something a top-down-only view can’t provide. Imagery from EagleView provides greater clarity than satellite imagery and 45-degree perspectives from the north, south, east, and west. EagleView partners with government agencies and specializes in providing solutions for public safety through oblique and orthogonal imagery and integrations with computer-aided dispatch (CAD) systems. Eaton then discovered that Maricopa County was already had access to the imagery through the County’s Geographic Information Officer (GIO). Once the 911 centers had access to the imagery license, they began using a web-based imagery viewing platform. Internet-based imagery alone wouldn’t suffice, though, according to Eaton. “Like most other PSAPs and 911 organizations, we’re very sensitive about security,” he says. Using the Integrated Pictometry Application (IPA) workflow integration, a next generation firewall, a proxy server, and other redundant security measures, Maricopa Region 911 had found its scalable solution. With aerial imagery and external map sources hosted on the internet, the NextGen firewall performs deep packet inspection to ensure that data arrives in the expected format from the expected source, so malicious data can’t get through to the PSAP. From there, a proxy server verifies that endpoint protection is enabled and prevents traffic from clients without endpoint protection. A mapped ALI client provides further endpoint protection by scanning for viruses and whitelisting applications as needed. Locally hosted basemaps accompanied dynamic weather data from Weather Underground, legacy maps and data points, and vehicle locators. The system compiles other regional data such as department of transportation traffic flow information and live camera feeds. Although Maricopa Region 911 has already realized significant benefits to its operations, Eaton is the first to admit that this is a scalable work in progress. “This could easily be scaled out to everyone else,” Eaton says. “It’s just a matter of setting up the outbound proxy on every single client.” The possibilities from there, he notes, are virtually endless. Since implementing aerial imagery into its web mapping platform, Maricopa Region 911 has seen increased coordination between PSAPs thanks to enhanced situational awareness and improved common operating picture. The improved ease-of-use for end users requires less training to achieve proficiency and saves time spent searching for maps and other datasets. Users can access high-resolution aerial imagery from the cloud with the click of a mouse. Call takers and dispatchers can also view and analyze accurate maps, property information, and parcel data from adjacent counties, even if Maricopa Region 911 doesn’t have a PSAP there. Amanda Bullen has been in the GIS Industry for the past 13 years working closely in the public sector with government and public safety. In her role at EagleView as Technical Manager for Arizona, New Mexico and Southern California she works extensively with the Counties and PSAPs in the area. Part of her job responsibilities include integrating aerial imagery into mission critical response software to give access to relevant and up to date information when first responders need it the most. She studied Geography at the University of Illinois at Urbana-Champaign and continues to enjoy the GIS world through her work at EagleView.